This is a must own if you are a student of the game and just a student of life, knowledge and equality. If you love hip hop and want to have some knowledge about the roots, cop this! Great tracks like ''Poison'' and ''Road To The Riches'' will take you back. 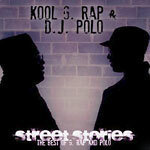 This overview pulled from Kool G Rap & DJ Polo's prime Cold Chillin' material covers all their best: from ''It's A Demo'' through ''Erase Racism'' with Big Daddy Kane and Biz, ''Rikers Island'' (the original 12'' mix is found here) through to ''Streets Of New York'' these street stories are the template that changed the game.